Danni has spent most of her life residing in and around Ipswich, but she fell in love with the Waterfront when she moved to the area back in 2014. A lover of sunsets and skylines; the redevelopment of a once industrial area into a beautiful, booming Waterfront cemented her fondness of her home town. Danni values the ongoing potential and opportunity Ipswich offers to residents, businesses and visitors alike, and is an advocate of all things Waterfront. She has a strong business mind, with an abundance of ideas to engage and entertain readers of all ages. Danni is a huge supporter of local businesses and projects, building solid relationships with partnering organisations, and can often be seen strolling round the Waterfront taking photos for social media! Outside of Waterfront Life, you’ll normally find Danni knee-deep in mud, wielding power tools: she is an OCR (Obstacle Course Racing) athlete and works for Spartan Race as the Kids’ Lead for UK & Ireland. Richard has spent most of his adult and working life in and around Ipswich. He and his wife have raised and schooled 3 children in the area and Richard is passionate about spreading the word about the quality of family life that is on offer. Richard has built and had hands-on running of, a group of companies in the area, diversifying his business interests through marketing, transportation, catering & property. In 2016, Richard and a handful of fellow Waterfront residents, inaugurated the Ipswich Waterfront Residents Association. The Association was founded, somewhat out of frustration, on the basis that a proactive Residents Association didn’t already exist, in such a high profile area of the Town. Richard and his fellow associates were also struck by how little communication existed between the residents, the business owners and the local authorities. To improve this lack of communication, the Residents Association decided to launch Waterfront Life, in print format – a high quality, magazine and online. Suffolk born and bred, Carla has always had a passion for art and design. Working at Archant for 16 years gave her a huge amount of experience of all aspects of design and publishing. She loved the buzz and the pressure of daily deadlines and enjoyed coaching her team to be the best designers they could be. Whilst at University, Carla dreamed of being her own boss and starting her own freelance design business. This dream became a reality in 2017 when she had the confidence and opportunity to leave Archant and go it alone. She has never looked back. When not designing logos, marketing material or magazines, Carla is out on the trails, running with her friends. She has completed 14 marathons and is looking forward to London this year. Growing up in Suffolk, Carly studied at Felixstowe Sixth Form and later relocated to the North of England to attend University. It was here, she discovered her passion for graphic design and marketing. 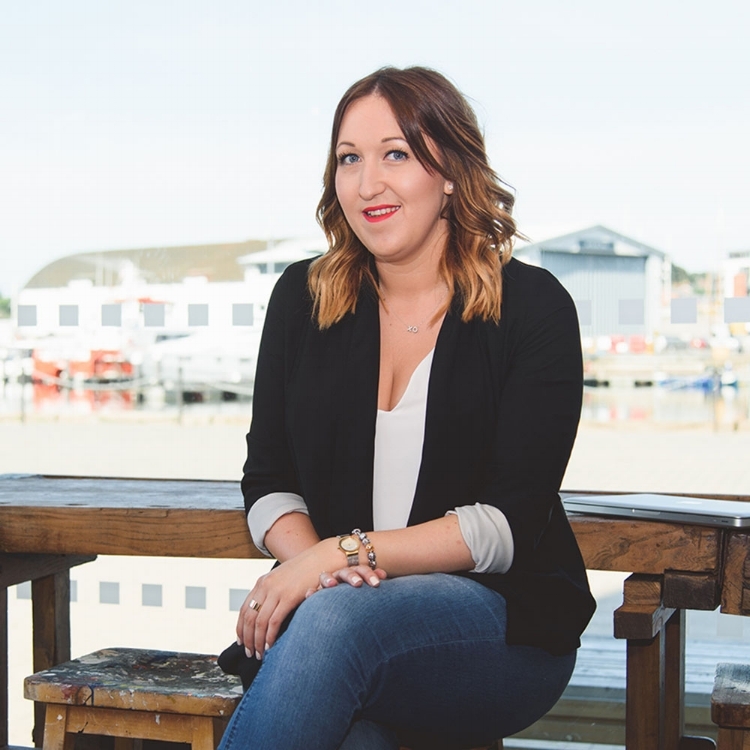 Carly followed her heart home to Suffolk, and spent most of the next 10 years in Ipswich doing the side business ‘hustle’, working as a designer in her free-time, all the while climbing the corporate ladder as a marketing executive. In 2015, she quit her day job to start her own business and fulfil the dream of a laptop lifestyle - working with clients whilst travelling the world. Nine countries later, Carly returned to Suffolk and moved in to the beautiful Ipswich Waterfront. When asked to support the start-up of Waterfront Life, Carly jumped at the chance to get involved with the community and learn more about the place she calls home.